Kazmir has had a very good start in life. The past couple of weeks I've been feeling reflective, emotional and hopeful as we marked the coming and going of Kaz's first birthday on June 29th. I've reflected on his birth, the evening turning to morning when we worked hard to welcome him to this world. It was a joyful birth and now I can say from experience we have a joyful little man on our hands . I've been thinking about those first weeks at home when I learned so much and grew so much. Kaz has been one of my best teachers. All along, not just those first weeks, but this whole year. I imagine this is one of his roles as we share our lives: mother and son. I've been feeling emotional. How could this year have passed so quickly and yet in moments seem to go so slowly? I'm feeling a certain amount of joy and sadness. Everyday we welcome something new in him and about him and at the same time let go and say goodbye to another phase of growing. Little habits that are so endearing in the moment like his newborn cry, his crooked smile, him laying in bed for hours nursing and cuddled against me have faded into memories as I now chase a speedy, curious crawler, stander, cruiser and drawer re-arranger around the house during his waking hours. This kid does not sit still! I'm hopeful, a bit superstitious or maybe just a romantic. At any oppurtunity I look at the stars and make a wish for Kaz and his life. I say a prayer and Kaz is first on my heart and mind. We blow out his first birthday candle on a homemade cherry pie we share with my parents and a coconut pound cake we share with Josh's family and I close my eyes tight as my heart fills with so much love and hope for my little guy and his big life that lies ahead. I pray and wish for his life to be LONG and filled with LOVE, BEAUTY, GOOD HEALTH and MUCH JOY. Happy Birthday Kazmir. The following piece, from medium.com, written by Kevin Ashton is relevant to me as I work on creative projects. Time management is the hardest thing for me, right now, as I do my creative work. I have lot's of good ideas and work I want to do. Being a mom, working part-time out of the house and all the projects on the homestead take up most the time. I struggle with saying no or yes to social commitments, community events, volunteering for this, that or the other thing. What is a creative person to do with big dreams and a few projects she'd like to accomplish on her plate? Light lasts far into the evening and deepens the green of the grass and ferns at the wood's edge to a rich emerald. There lies a cool darkness as I look into the dark woods. Trills of birdsong echo off the trees as creatures settle down for the night. Lightning bugs take flight, dancing upwards from the wildflowers: daisy, clover, buttercups. The pinks and purples of geranium, dianthus, columbine, rose, sage and iris bloom electric in the twilight. Deep pinks and emeralds play together as exquisite opposites. Midsummer night is here. In Slavic countries Kupala night is celebrated. Here is a photo and a video of what happens in Poznan, Poland on Kupala night. Thousands of lanterns are lit with fire and float away into the twilight sky. Beautiful isn't it? Kupala is a Slavic holiday celebrated in Poland, Russia, Ukraine and Belarus. Originally it was a pagan fertility rite, celebrated in June on the longest day of the year. Kupala celebrates the summer solstice. Midsummer night is the festivity of unity, the congress of fire and water, Sun and Moon, man and woman, fertility and harvest, and joy and love. This holiday dates back to pre-christian times. As with most holidays, the pagan holiday was absorbed by the church in some Slavic countries and is celebrated as a holy day honoring St. John the Baptist. Kupala is a Slavic goddess whose name means to bathe. Interestingly the squatting woman found on many Slavic embroideries is the goddess Kupala. She is the goddess of springs and water. Kupala rules herbs. Wildflowers, ferns and birch trees are sacred to her. She brings about joy, health and cleansing. Her fire aspect leads to purification, transformation and protection. This longest day and shortest night honors two important elements: water and fire, the sacred feminine, spirit of life, creativity and destruction. Bathing in natural waterways like rivers, streams and lakes is a ritual purification. Water also symbolizes fertility. Fires are burned and around them there is much singing and dancing. Young people jump over the fire to show their bravery and faith. A man and woman jump over the fire while holding hands to see if they will forever stay together. If they fail to make the jump while holding hands it foretells a separation. Young women weave together beautiful wildflower wreaths and float them on the water with candles. The path of the wreaths in the water can foretell about the woman's fate in love. Woven flower wreaths are worn on an unmarried woman's head. In Polish this flower garland is called wianek. At night the maidens enter the forest, followed by the young men to look for herbs and the mythic fern flower which brings prosperity and luck in life to anyone who finds it. I'd like to write about threads, metaphorical threads, threads that one can pick up and follow. The threads individually come together and become part of a bigger pattern, a bigger piece. With these threads an embroidery piece is being sewn that tells a story. I have been following personal threads of identity, authenticity, passion, connection and resonance. Sometimes I happen to find threads to follow. Other times I go searching for a colorful thread. I find it particularly magical when a thread finds me. Another strand is sewn into my story, the work I am doing, the studies that I am pursuing and the life I am creating. This is a very personal journey and at the same time the embroidery involves bigger pieces of history, story and culture. It is the fabric of lives. "Every intention, interaction, motivation, every colour, every body, every action and reaction, every piece of physical reality and the thoughts that it engendered, every connection made, every nuanced moment of history and potentiality, every toothache and flagstone, every emotion and birth and banknote, every possible thing ever is woven into that limitless, sprawling web. There was a time, in 2010 and 2011, when I worked with a mentor, Valerianna, who is an artist and friend at RavenWood Forest Studio of Mythic and Environmental Arts. I was looking to connect on a deeper level with my art practice. I needed perspective, a sounding board, someone I could talk with who understood what I was wrestling with. Questions about authenticity and identity in my art practice loomed large. The desire to create something meaningful and beautiful has been a driving force in my life. Creativity needs an outlet. A dialogue of meaning about authenticity, identity and beauty is an important conversation that happens in my head as I begin new work. I think about these things and feel them out in order to bring forth something into the physical world. For a while, months and months, things were muddy, murky and not at all clear as I worked with my mentor, sketched and wrote in my journal. I was wondering if I was really making any progress? When will my vision for my arts practice become clearer? Will I ever be more confident in understanding the motivation for my creative work? Out of no where all of that changed. Bobbie Sumberg's book, "Textiles", full of beautiful, intricate and colorful threaded embroidery was the catalyst pointing me towards the path I am on. It stopped me in my tracks while perusing the shelves at the library in the winter of 2011. The book is full of textiles from all around the world. 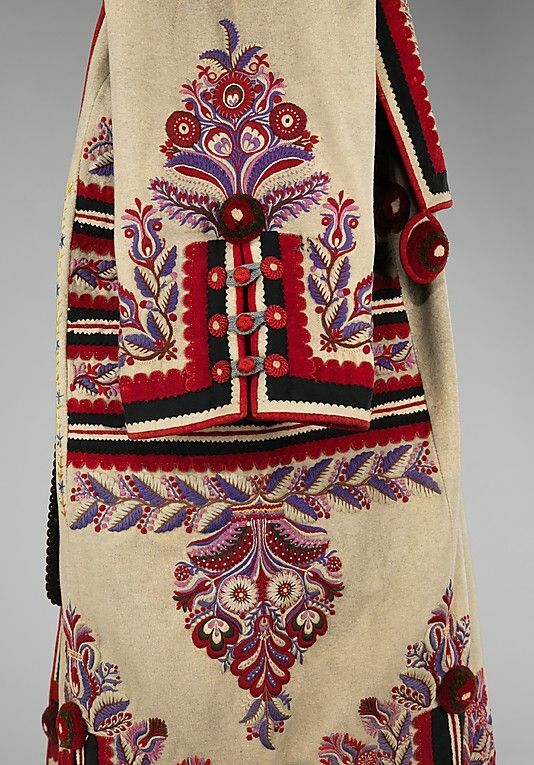 It contains photographs of some beautiful examples of Hungarian folk embroidery. As I briefly flipped through the photographs the Hungarian designs, colors and patterns struck me to the core. I knew I had to pay attention to this feeling so I took the book home with me. The next morning I turned on the local college radio station. I began to look more closely at the intricate Hungarian embroidery work in the book. Unbeknownst to me, a polka show was on at that time. This got my attention. In between upbeat polkas, advertisements for local Polish businesses were played. I live in an area, the Pioneer Valley, with a large Polish-American population. After some time listening to the polka show and looking at the book I thought I'd look up Hungarian and Polish arts in western Massachusetts on Google. Low and behold a Polish art class was to begin at the Springfield Museum the next month. I signed up for it. These seemingly small events lined up at about the same time and got my attention. The messages coming to me were closely related to my heritage: the blood flowing through my veins. The hours spent alone in thought that winter morning, enjoying a book and listening to the radio woke me up. My Hungarian and Polish ancestors seemed to be gently shaking me, waking me up to what is there, what is here and what is in me. I was surrounded by eastern European stimulation that was sure to get my attention. Within 24 hours I awoke to a path. The path appears through a deeper connection with my heritage. The minor threads began an important journey that grow in different directions. I need to look forward, backward and be in the moment. Lives are weaving together. My life with my ancestors, my living relatives, new friends and mentors. Threads of inspiration, love and longing drive me to read books, ask questions, look at images, learn the Polish language, create new art work, designs, paintings, paper-cuts and keep in touch with my relatives and the friends I met while traveling in Poland and Hungary. Stories and history are there to learn from and help me gain understanding. Places beckon me to return. Perhaps, I've simply become aware of my place within a complex embroidery that has existed all along. The colorful threads continue to manifest, come together and take shape, weaving something I can recognize and see with some perspective. And yet a lot of work remains to be done. At times this is a wide and deep mystery. I'm left asking why. I've always been attracted to strong colors and bold, graphic design, especially designs that connect with the natural world. For a while southwest and Mexican arts were a big inspiration to me but something was missing, a very personal connection. I felt like a tourist. I didn't feel complete and my work didn't feel grounded. I needed to connect with something deeper. Who am I? Why am I attracted to certain sounds, colors and patterns so strongly that I truly become awestruck? Why, musically, have I always been inspired by gypsy and eastern European music, violins, accordions, minor keys, edgy harmonies, singing and sounds of longing that pull on your heart strings? After looking deeply at the Hungarian embroidery in the textile book I realized what is going on. Aha! The garments, like the man's mantle pictured below, wedding dress, bodices, hair pieces and many more items were sewn with such care, such love and such attention to detail. Flowers bloom in vibrant colors, patterns form a kind of rhythm of elements in the dress. The costumes exhibit such pride and joy for one's culture, one's life and one's connection with nature and the traditions of their region. The skill was passed on woman to woman, mother to daughter, grandmother to grand-daughter, generation to generation. These people lived such busy lives growing food and gardens, growing materials for their homespun linen cloth, making and mending clothing, doing household and farm chores, preserving food and the list of the hard work goes on. All this work was done everyday without the modern conveniences we have today. And it was still important to the women to spend time and attention doing intricately sewn handwork to make their lives reflect even more beauty. I so admire the skill and hard work that went into many traditional practices. I like the do-it-yourself resourcefulness that was a necessity in the past. I know I long to connect more to that kind of resourcefulness and I don't think I am alone. I believe my life is infused with more meaning when I can enjoy creating some of the things I use and need. 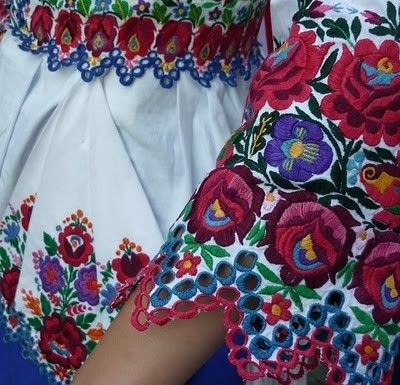 The beautiful Hungarian and Polish embroidery I love to look at, the pieces my ancestors must have made and my drawer filled with doilies that my grandmother and great-grandmother made inspire me and reminds me of this. My ancestors have been calling out to me. I've been looking for my own personal story, my history and the story of my ancestors. All along I wanted to deeply connect with my ancestor's traditions, lands, sounds, smells, foods, colors, plants, designs relating to the natural world. 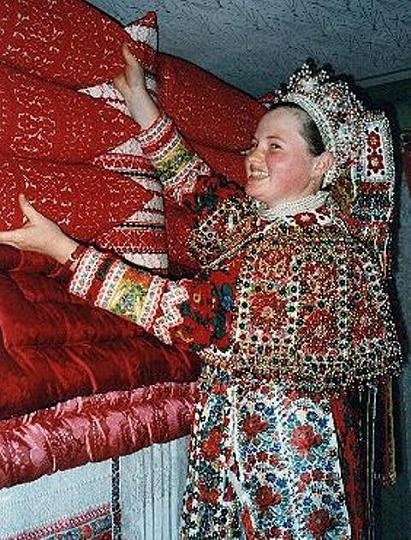 The Hungarian embroidery work woke me up to this reality. This is my quest. All along I was attracted to certain styles, music and aesthetic in relation to my personal heritage, my Eastern European roots. This led me to realize a vision, an adventure and a shift in my creative work. I decided to take a trip of a lifetime to connect with my family and the land and villages in Poland and Hungary. All this has brought me much curiosity, depth and meaning to my creative practice and work. My experience continues to sustain and feed me. I've created a line of gouache paintings and paper-cut designs which are available as blank greeting cards and archival prints. The graphic, bold designs and bright colors used in my work and inspired by eastern European folk embroidery feel right aesthetically and appeal to me. They are a wink and a nod to the beautiful embroidery designs that I find so lovely. So many more ideas and images swim around my head, waiting for when I have chunks of uninterrupted time in my studio and at my easel to explore, paint and cut paper. This is the rabbit hole I fell down two years ago and now there is no turning back. The journey is deep and vast. The more connections I make the more I want to know. One lifetime doesn't seem long enough to get to the bottom of my desire for understanding. This post is a little collection of some inspiring pictures of peasant cottages and their gardens. I can't get over the simple use of color around the the windows and between the logs of the cottage in the first photo. Turquoise and cobalt blue is one of my favorite color combinations. All but the first photo here were taken by me two summers ago while I was in Poland. There are a number of lovely Skansens (outdoor and living history museums) in Poland that preserve folk, wooden architecture. Some towns are known for their existing homes exhibiting and/or preserving old architectural styles, Zakopane being one of them. The old peasant homes breathe with life. A thatched roof, dirt floor and wooden walls, all organic and natural materials, allow the home to literally breathe. This makes me think of Hundertwasser and his manifesto where he proclaims that the space we inhabit, the architecture of our dwellings, is like another layer of skin. Our architecture is a layer outside our physical layer of skin surrounding our bodies and the layer of clothes we wear. Soon I will write more about old folk architecture, what I know and learned from my travels and reading. There is a lot of work to do at home in my garden this time of year. I'm am feeling particularly busy, grounded and centered around the home with all that needs to get done. I haven't been able to sit at my computer to write much. But, gardening is an excellent activity for gathering one's thoughts! The writing will come. The weeds grow fast next to the seedlings that are just sprouting. Then there is the thinning that needs to get done so that the seedlings coming up do not crowd one another. Some vegetable beds still need to be made and planted with beans, carrots and beets at the community garden plot down the street. At home, I'm going to make a hay bale raised bed in which to plant the delicata and spaghetti squash so they can grow down the hill towards the woods, out of the way of our other garden beds. Radishes, potatoes, garlic, cilantro, arugula, lettuces, horseradish and spinach are up. Some basil and tomatoes are in. Today I'm going to a flower nursery to buy some annuals to put in pots and hanging baskets around the house. Soon I will be caught up, ahead of the weeds and enjoying watching the summer growing of all the plants, flowers and food on the land. This week I spent a lot of time in the kitchen cooking with some of the goodies found in the garden this time of year. So far the two main ingredients from the garden have been Rhubarb and Lovage. How many of you know about the herb, Lovage? If you have never cooked with this herb, it's time to start feeling the Lovage! Lovage is an amazing plant with a beautiful, fragrant odor and tangy, complex, out of this world flavor. My husband Josh spent two years living in Romania when he served in the Peace Corps. While there he ate many sour soups, called Ciorba, which uses this herb to add an unmistakable flavor: tangy, a bit sour and very flavorful. Ciorba de perisoare (meatballs), Ciorba de burta (tripe), Ciorba de cartofi (potato).... the list goes on. Josh and I went to Romania and Hungary 10 years ago for our honeymoon. We had a wonderful trip and experience visiting and staying with some of the friends Josh made while in the Peace Corps. True hospitality met us during every interaction and with all the friends with whom we spent time. We traveled all around the country: Bucharest, Pitesti, Sighisoara, the Danube delta, Constanta (on the Black Sea coast), the mountains... As you can guess, I was struck by the culture and folk arts while in Romania. I especially admired the ornamental wood carved gates found in a certain region of Romania and the woven wool rugs were particularly striking, I loved looking at the rural dwellings especially. My friend Razvan remembers me taking a special interest in the folk arts on that trip. Perhaps some seeds were sown and embers were left smoldering...a foreshadowing of my interest in Eastern European traditions. I took the following photos during our trip in 2003. After this little photo tour you'll find a tasty recipe for Ciorba de perisoare if you would like to try and make it in your kitchen. I made Ciorba de perisoare on Friday and brought a little bit of Romania into our home for an evening spent with some friends. Oh, the smell of that soup! My house was filled with it's fragrance. We played all our favorite Romanian music which was bought on our trip many years ago. Kids and some adults danced around the living room table, what fun! If you can't travel to the place, bring it to you! Bring to boil 6 cups of water in a pot. Finely slice: 1 onion, the parsley, the parsnip and the carrots and put them in the water. Add the beef (or veal) meat. In the mean time soak the bread in water then squeeze it. Mash the bread with a fork. Mix the ground meat with the other finely chopped onion, the mashed bread and the rice, and season with salt and ground black pepper. For a more tender meat composition add 2-3 tablespoons of water. Make small meat balls rolling them with wet hands. When the vegetables become tender put the meat balls in the boiling water. Reduce heat and simmer for 30-40 minutes. When the soup is almost done the meatballs are coming to the surface as the soup simmers. Finely chop the lovage and add it to the soup, and then season with salt and vinegar. If you do not have lovage, you can use fresh parsley leaves instead. The soup is delicious served with a bit of sour cream, and a hot pepper on the side. I'm working on a series of writings I am calling, A CALL FROM THE ANCESTORS. With it I'll be addressing why I am inspired by the folk and peasant arts and traditions of Eastern Europe, especially Poland and Hungary. Why am I pulled to learn and experience more in relationship to my roots? Why does a place and a way of life inspire me so? The following words came in a brainstorm as I think about this and begin writing. You know that feeling when something strikes you deep to the core? A feeling of recognition, attraction, intuition and knowing? There are moments in life when I've recognized this feeling. I know when it happens and it is important for me to stop and pay attention. I do not know how this works exactly but I do have my thoughts on why it happens. Sometimes things add up and line up. Clear signs point you in a certain direction. I believe my ancestors have a hand in this, like they are beckoning to me, calling to me and I am following their lead. My ancestor's blood runs through my veins. In my body there is genetic and a kind of energetic memory linking me back to the places where my people lived, loved, toiled and died. I am learning, teaching myself about the places and ways because so much was lost to me when my family became "American". It's a very common phenomenon isn't it? Immigrants come to the new world and and settle into new ways. They melt into the melting pot in order to work, raise families - survive. Yet our roots are left raw and exposed. Some families work hard to stay connected to the old country, the heartland. And some families slowly assimilate to become more American. I long for a deeper connection with and understanding of the old ways. My grandmother Stella left Poland for America in her early teens. She wrote letters to her family in Poland and even went back for a visit in the mid-80s. She spoke Polish but did not teach it to her children or grandchildren. She was always making and sharing Polish foods with the family: pierogi, golumbki, kielbasa, poppyseed roll. She tended her small garden and loved watching the flowers bloom. My Hungarian great-grandfather George and my great-grandmom Angel were connected to their family in Hungary. George was born in America but went back to his ancestor's village to find his wife, Elizabeth. Much later he returned to visit his family a year or two before his death. When George and Elizabeth passed on there was no longer a strong connection between the families across the land and ocean. No one is to blame. Times and circumstances change. I'm sure the politics of the time, WWII and then the cold war between capitalist America and communist Poland and Hungary, did not help to keep the ties strong for the next generations. However, one needs a place to grow, a place to settle and go deep, a place of understanding and connection with what came before. One needs to feel a connection with community, family, traditions, history, stories of their place and of their ancestors. "If you don’t know where you are, says Wendell Berry, you don’t know who you are. Berry is a writer, one of our best, who after some circling has settled on the bank of the Kentucky River, where he grew up and where his family has lived for many generations. He conducts his literary explorations inward, toward the core of what supports him physically and spiritually. He belongs to an honorable tradition, one that even in America includes some great names: Thoreau, Burroughs, Frost, Faulkner, Steinbeck – lovers of known earth, known weathers, and known neighbors both human and nonhuman. He calls himself a “placed” person." "... if every American is several people, and one of them is or would like to be a placed person, another is the opposite, the displaced person, cousin not to Thoreau but to Daniel Boone, dreamer not of Walden Ponds but of far horizons, traveler not in Concord but in wild unsettled places, explorer not inward but outward. Adventurous, restless, seeking, asocial or antisocial, the displaced American persists by the million long after the frontier has vanished. He exists to some extent in all of us, the inevitable by-product of our history: the New World transient. " "Back to Wendell Berry, and his belief that if you don’t know where you are you don’t know who you are. He is not talking about the kind of location that can be determined by looking at a map or a street sign. He is talking about the kind of knowing that involves the senses, the memory, the history of a family or a tribe. He is talking about the knowledge of place that comes from working in it in all weathers, making a living from it, suffering from its catastrophes, loving its mornings or evenings or hot noons, valuing it for the profound investment of labor and feeling that you, your parents and grandparents, your all-but-unknown ancestors have put into it. He is talking about the knowing that poets specialize in." I long for this knowing and by following a path of longing and resonance I have begun to make connections to a deeper understanding of who I am and where I come from. My ancestors call to me on this journey. The quest simultaneously connects me to the heartlands of Poland and Hungary and roots me to my home in the hills of New England. As I move ahead and dig deep many things appear, unfold, resonate and become recognized. Connections are made. A path continues to unfold with every step I take. My father's ancestors were Polish and Hungarian people of the land. They were from the small villages of Korczyna, Poland and Harskut Hungary. My great-grandfather Jan was born in the thatched roof, white washed cottage in Korczyna, Poland pictured above. My great-great grandmother and Cocia, Aniela and Aniela, are photographed wearing kierchiefs and aprons on their land in Korczyna. My dad can remembers his Babci Helena's gardens in Philadelphia, where she and Jan landed with their children, one of them being my grandmom Stella, after emigrating to America in the 1930s from Poland. Jan knew that true wealth was having land. So when he bought his small row home he bought the undeveloped lot next door. This lot became their orchard and garden. My dad helped with the garden chores and fondly remembers his grandmother's raspberry jam. My dad went on to college then the Air Force to become an airline pilot. His work was in the sky. My parents are not avid gardeners. Some pretty flower beds are tended to and the lawn is always mowed. We did not raise or preserve our own food. The pulse of my heart moved me to pursue learning about and practicing gardening for the sake of beauty and food. I woke up to this fact in my early 20's after university when I spent a couple years working on a large fruit orchard in Solebury, PA. The desire to connect to the land and work it is running strong in my blood. I used to wonder about my obsession with gardening? Where did it come from? One of the most satisfying things to me is working in the dirt with the plants, flowers, herbs, fruits and vegetables. A quiet day spent alone outside with the sounds of the wind and songbirds as my company is heaven. The making of beds, planting of seeds and removal of weeds marks the time passing. My feet connect to the earth, I breathe fresh air, feel the warm sun or the cool mists. While sitting in on a sociology class in Poland the professor lectured that peasants love the land more than anything. They have a very strong sense of territory. How can we not love that which sustains us? The peasants were completely and utterly tied to working the land and the land itself. Their work, traditions, symbols, stories, rituals, costume reflect this in a profound way. They were not separate. Life was not easy. There is a fundamental truth to living in balance with the seasons, the crops, the weather, the dirt. "When death is staring you in the face even a college graduate becomes a person again, so does an engineer. At those times everything falls off life like leaves dropping from a tree in the fall, and you're left like a bare trunk. At those times you're not drawn to the outside world but back to the land where you were born and grew up, because that's your only place on this earth. In that land, even a tomb is like a home for you." Certain places resonate strongly with an individual. Do we remember things on a cellular level? Are ties and memories passed on from generation to generation through blood, DNA, spirit? It's interesting to me that there is such a similarity in climate and landscape between Korczyna, Poland and Harskut, Hungary, the rural landscape around the Philadelphia area and even in Cummington, MA where I make my home. Rolling hills, green hay fields, wooded forests, distinct seasonal changes. I feel so at home in these places. They are familiar. I fell in love with the landscape around Krakow, Korczyna, and Harskut. The orchards there were full of plums, apples, cherries, walnuts, peaches, pears, elderberry. Most homes seemed to have a large garden with cabbage, potatoes, dill, currants, raspberries, blueberries, carrots, beets. At long last I met family and connected with them in such a meaningful way. They were wonderful hosts, so caring and hospitable, and happy to share with me their lives and lifestyles. My cousins Anna and Karol had their own large gardens at their homes in and outside of Korczyna. They proudly showed me their garden plots and fed us the goodies growing there. Times have changed for my relatives in Poland and Hungary yet I can still see how their deep ties to the land manifest. Cousin Paulina gave me honey from her mother's hives. Her grandfather Roman shared homemade fruit wine with me in his home during an afternoon visit. In Hungary, my cousin Anci and her husband Laszlo have a large parcel of land a short drive from their home in another village near Harskut. Their parcel is full of wine grapes and fruit trees. Hungary is wine country. We spent a memorable evening on this land under a grape arbor with Laszlo playing the accordian and all of us singing and sharing songs. Tears were shed that night. The moment was so meaningful. Roots, family and the land take on a deeply meaningful role. There is nothing like sitting around with one's family on a beautiful day, outdoors, enjoying company and literally the fruits of big gardens and hard work. Since connecting with my living family overseas and the land of Poland and Hungary, I begin to understand my family and myself more. My questions about who I am and where I come from are slowly answered. Still, I have so many questions and such yearning for further connection. This longing pushes me ahead and my ancestors pull me forward on a journey. I'm taking steps on a path where resonance unlocks the answers to many a mystery. I will explore these themes more in future posts where I'll write about identity, authenticity, passion and connection and how these ideas play out in my art practice on A Call from the Ancestors. This spring, as my gardens blossom and I plant seeds, I've been blessed with heartfelt reminders of the connections I have with meaningful people who touch my life. I am so held and for this I am thankful. A professor and friend from Poland answers questions I have about folk art traditions and culture in Poland and sends me beautiful Easter tokens from Krakow. A woman I look up to and befriended in Poland who is a professor and author surprises me with a gift of books on Polish topics of interest after I bought a book she wrote. My local town church sends a prayer shawl for Kaz and me, visitors, a home cooked meal and offers of child care after a car accident left me in pain and tired out emotionally and physically. My parents bring their love and some home cooked meals for our freezer when they come up for a visit. My mom buys me a beautiful book about Polish cooking, full of recipes I cannot wait to try. Family and friends call to check in and send their love. For all these things I am so thankful. Loving connections is what life is all about. Loving one another is what life is all about. These generous connections have sustained me after a long winter, a time of huge personal transition into motherhood. I keep waiting to feel like I've caught up with myself. I keep waiting for my head to clear and breath free from under the waters of transition. As I wait for this moment I realize that things will never be the same again. Adding the role of mother to my identity has truly rocked my world. At the same time I am hungry for inspiration, desiring a clear voice and purpose. I want to write about what inspires me, what fires up my creative soul, the work I do, the beauty that is out there in the world, what I am learning, the interests and quests that pull me like the moon pulls the tides. I work with starts and stops. I've lost the ability to have open ended time and full days ahead to attend to my interests, goals, studies, art practice, music, blogging, gardening and other creative pursuits. In rare moments when I am alone with my thoughts I get hopeful and excited about the possibilities my dreams have to offer. I know they are there in background, following me around as I chase after a curious and crawling Kazmir. They whisper in my ear when I find myself with a quiet moment. I go weeks listening to Polish language tapes most days and making progress. Then I go weeks without getting one lesson in. I'm reading books that deal with my interests. My local library finds me books I am anxious to read like Norman Davies, "Heart of Europe: A Short History of Poland"and "Stone Upon Stone" by Mysliwski. Then when I open a book at the end of the day I find I am able to read a few pages with an alert mind before I want to drift off to sleep. Progress is very slow going! My books become overdue. I lose momentum and get frustrated. My art making is on hold for the moment. Imagined images pass through my head like ghosts I can't grasp. I imagine the texture of a wet paint brush full of bright color and spreading it across paper like one might imagine the sensation of sinking into a warm bath or taking a bite of a fresh out of the oven, butter soaked, homemade, bread. I fantasize about color combinations, patterns, big canvases and art shows. It's time to breathe new life into this blog. I worry, can I do it? Can I focus? Can I keep a thread going? Can I discipline myself and write interesting pieces from the heart? I think I can. What if I set a goal to post once a week? I think that is reasonable. As I pursue my interests and look to study Polish and Hungarian culture and arts further, my blog can become the place of accountability to myself and to others who may find these topics and/or my method of pursuing my passions of interest. Spring reminds me that there is always another chance to begin afresh. The quality of the light in late winter is distinct in my mind. I've felt for a long time that the end of February through early March seems like a season all it's own. It is not spring yet but it doesn't feel like winter anymore. The light is noticeably returning as I can see the time on the clock at 6am without having to turn the light on. The evenings are stretching out so that I see the western horizon line faintly aglow as I look out the window while nursing Kaz to sleep. I am a creature of light and love how the play of seasons and the time of day is forever changing the pallette in which I dwell. Last Friday I found myself taking the long way home from an outing to the Clark Art Museum in Williamstown, MA. The mountains are just a little more dramatic over that way and I loved losing myself on the country roads, passing dairy farms and expansive vistas as I drove higher and higher in elevation. The whites of the snow also became shades of blue, gray and purple as the sky, light and shadows, played across open fields and forested mountainsides. Another marker to this season, which is other than winter and spring, is the flowing of the sap within the trees. Things are stirring and coming back to life. A highlight of living here in New England is the marking of this time with Maple syrup making. It's been a couple years since we've tapped some of our Maple trees but today we put in six taps and hung from them the metal buckets to collect the sap. We don't make a big production out of this, just a little fun and work which gets us outside with the end result being a quart or two of syrup for morning pancakes and waffles. I look forward to checking the buckets everyday to see if they need emptying and putting a large stock pot full of the sap on the wood stove to eventually be boiled down to the sweet syrup. I find that getting out this time of year is special. The chirping of the chicadees have that beautiful springtime quality, the sun is higher in the sky and shines down a bit stronger. A highlight of this gray and snowy February was visiting Mass MoCA for the art museum’s free day a few weeks ago. After packing the car with baby and stroller we drove off through the hills of western MA to North Adams the day after we got 17 inches of white, powdery snow. What a beautiful drive! The wheels of the car were hushed as they turned on top of a packed layer of snow on the streets while sun shone down on pure white, reflecting sparkles like crystals. The most beautiful and interesting piece of art of the day was Xu Bing’s Phoenix installation. This is the kind of creation that makes your jaw drop in wonder as you enter the huge space and catch your first glimpse of the two Phoenixes. Masses of metal and bamboo - construction and building debris from building sites in Beijing - defy logic, suspended in the air from the ceiling as if flying. Rubbish is arranged artfully and becomes poetry: beautiful and harmonious. The two phoenixes are almost 100 feet long and weigh over 20 tons in all. Originally the works were commissioned by a real estate developer for a glass atrium connecting two World Financial Towers in Beijing. While visiting the site the artist was impacted by the contrast between the raw, gritty realities of the laborers and their living and working conditions and the building's splendor and opulence. This reality reflects the truth of two worlds living side by side in Chinese society. Wealth and excess contrasts with the stark and gritty. One of the things I find particularly interesting about this work is it’s connection to the creation of a societies folk art: everyday people creating works of meaning with materials that are at hand. Xu Bing uses found materials at the construction site and builds the sculptures with the migrant laborers, the same laborers responsible for the growing skyline in Beijing. His muse is the mythical symbol of the male and female phoenix. “...this multifaceted symbol which has signified a multitued of meanings throughout history, from imperial power and wealth, to prosperity, fertility and eternity, The artist was particularly attracted to an image of the phoenix from the Han Dynasty, when the bird was often featured in male/female pairs like those now suspended from MASS MoCA’s beams. Steel rebar, girders, bamboo, scaffolding, conduit, shovels, hard hats, gloves and other evidence of labor (demolition) form the body, feathers and talons of Xu’s interpretation of these mythical birds. The heads of both the male Feng and the female Huang are made from the nose of an industrial jack hammers, a contemporary translation of their strength and ferocity (historical images of the phoenix often show the powerful bird with a snake in its talons or beak). I'm always especially interested in a creation when it's connected to folk art traditions. Something pure happens when the playing ground is level and art is made for something other than the enjoyment of the elite. I wish I saw the sculptures lit up at night with the LED lights that outline these pieces. I might try and get back to the museum to see this before the exhibit travels on down to NYC. I believe the next place it will inhabit is a cathedral! I'd like to see that too! I spent some down time yesterday listening to this conversation between Jack White and Conan O'Brian who are both bright, talented and who excel at their crafts. I love an opportunity to learn from the masters and was interested to hear what these fellas had to say about the creative process. It's a long conversation but something you can have on in the background as you do the dishes. Sitting down with their drinks, this is more a conversation between friends, comfortable and joking around, than an interview. I appreciate how candid and vulnerable they are with each other and their thoughts. It doesn't matter if you are a musician, a comedian, a painter, a writer, or for that matter, anyone trying to bring something to life and share it with others, there are universal truths and connections here for all of us who are creating something. Topics of conversation include back and forth dialog about work, talent, vision, authenticity, success, women, religion, the performer/audience relationship, Bob Dylan, upholstery and the number three. It's solstice already. The dark, cold, quiet time. In moments I'm met with an extreme sense of well being. Like when I'm driving over a hill, heading west at sundown and get to see the layers of clouds exhibiting many shades of gray with pastel colors illuminating them from beneath as the sun tucks itself in beyond the horizon. Tonight I had such a moment of quiet in the car, looking at the play of colors in the clouds and imagined sitting down to work it out with my water colors. Another time is when I stoke the fire in the wood stove and the logs light up cheerfully with bright flames providing a flickering dance to look at and cozy warmth to sit in front of with Kazmir and play. I've been listening to classical music a lot lately, the local public radio station in the car and using my Spotify account to listen to all kinds of interesting instrumental and vocal music. Russian folk guitar and the singing of Anonymous Four, their Wolcum Yule album, has been played a lot these past days. This stuff fits my mood perfectly. I need quiet, reflective music, nothing too cheery or upbeat, something soul soothing and beautiful. Perhaps its my solace in this time of constant care giving. Giving all I have to another being and living by my son's schedule. I need soothing. I also need soothing in this time of hard realities in the world. In my head, I've been thinking and dreaming about things I want to do. Things I'd like to make time for in my life. It's that time of year too. Time to reflect and make plans for the year ahead. I feel like I may be ready to begin my "independent studies" again soon. I just need to organize myself and my things so that it is easy to work on what I want to work on when I have a brief window of time. I just don't have a lot of open ended time. I get an hour here and an hour there and then there is the evening hours which are often still punctuated by Kaz's stirrings and need to nurse as he settles down for the night. I'm not good at working with interruptions or with clutter around. I need clarity around me so that I can think clearly. So I'll just have to do my best in this new reality. I do not want to stop working on what I was working on before the baby arrived. I want to pursue my dreams and passions and also be an example for Kaz so he can grow up witnessing adults around him following their dreams. I got an interesting email today from a man who found my blog by looking for information for the village of his ancestors which happens to be the same village where my Hungarian ancestors lived. This email got me to look back at my blog and read the post he found. I also read other posts from my trip in the summer or 2011. Wow! What a trip. Was that really me? I'm in such a different place now but still I know all that experience lives inside me. There is a lot more desire and longing for connection, understanding and learning in these areas of interest...folk culture, eastern Europe, art making and family.... I think it's time to start making baby steps in that direction again and hopefully some momentum will build and I will be able to move forward on dreams that are important to me. Speaking of the holidays and dreams I will spend Christmas in Krakow someday. I just saw this link, an article on CNN"s travel page about Krakow at Christmastime, made by someone on Facebook and it totally touches on my longing to get back to Krakow....Old town center, Christmas Market, mulled wine. Time to really start my Polish language tapes in earnest. On another note, it has been an exciting couple of months in that I've had my art work up at the Meekins Library in Williamsburg MA for November and December. It's been a very successful show and have gotten nice feedback, sold a few prints and lots of cards and may have gotten a commission to make paper cuts for a lampshade. My cards have been selling well in the handful of places I have them. That feels good too and I look forward to spending more time organizing and working on my design business this winter into next year. October is drawing to it's end and time continues moving it's swift pace. The season of fertile summer, flowers, babies, green leaves, warm days is very much behind us as I take a deep breath and begin to catch up with my life. For me, since June, it's been the season of "baby". For awhile I barely attended to what I would normally be doing in the summer and early autumn. The feeling of newness and unfamiliarity is shifting into another state. Kaz, Josh and I have really become a unit and now the new normal is settling in. Some routines have been established and still there is a lot that keeps us on our toes. I imagine that raising children keeps you on your toes at all stages, so here we are. Yet despite this awesome focus of most my attention, some attention is being refocused back on me and my pursuits.....ahhhh....art...gardens...writing. We have a new home studio/office that we built last spring. As I sit here typing the rain falls, I look out the new, big picture window and I notice that most of the leaves are off the trees. The beech trees are the last to shed their leaves in our woods and I can see their green, yellow hue mixed in with the newly exposed greys and browns of bark and branches. I love when once again I can see the skeletons of trees and the space around us in the new way. We have a western view of the hills across from us, once the leaves are gone, where it is nice to watch the sun set. Next to the Streeter Cemetery on Old Stage Road some cows wandered over to the stone wall and seemed curious as to what I was doing. I explained that I just wanted to take a few pictures as they posed for their cow portrait. Finally, I can't end this post with out a picture of Kazmir and I in our warm, wooly sweaters, snuggling up at the Ashfield Fall Festival. It's been a little over two months since I last wrote a post. On the home front, we were finishing up a studio/office building project during my third trimester and that took what little attention and energy I had. Then I gave birth to our baby. Good reasons to take a hiatus, but I have missed writing and posting. I hope to get back to the blog on a more regular basis yet time and what I am able to accomplish has taken on whole new dimensions now that I'm caring for a little person. I return a changed person. I feel fundamentally different to the core in one of the most miraculous of ways. I've gone through an initiation and have begun my life as a mom. Not only was my son born on that special June morning, I feel that I was reborn with him. There was an unforgettable moment during his birth towards the end of the eleventh hour when I was in the water birth tub. I stood up to position myself for a mighty push to move us along. As the contraction came and grew in intensity I had a feeling I may pass out. Instead, I closed my eyes, pushed, and a flash of white light, like lightening, seared through my body and overtook my being. My physical body seemed to disappear into the sensation and for an instant my baby and I were a bolt of lightening, pure energy, transforming, working and moving towards our new life. His birth was many things to me, a collection of beautiful and intense moments that I feel blessed to have had the opportunity to experience. I had a natural, unmedicated birth like I had hoped with wonderful care from my midwife, doula, nurse and Josh, who was the perfect birthing partner. Best of all a beautiful, healthy, sweet, little boy arrived in our arms at 9:58am on June 29th ...all 7lbs 2.4 ounces of him. We joyfully welcomed Kazmir Bernard Wachtel to the world. It's hard to believe that he has been with us for almost 7 weeks. A few people have said to me, "Doesn't it feel like he has always been with you?" Yes. It does. He fits right in and it feels natural that the pure love we feel and interest we have for his care are almost all consuming. And this is perfectly ok. Infants need this love and attention. Already, I can see that this time will fly by and soon I will wonder at how fast he has grown up. There are sleepless moments, crying spells, fussiness, dirty diapers and brief longings for quiet moments alone to attend to whatever I want but the warm bundle, sweet smile, plump, emerging fat rolls, intoxicating smell, quiet and content nursing moments give the hard moments perspective and make it all totally awesome. Truly, moments of AWE. How did we chose the name Kazmir Bernard? We like the name for many reasons. Early in the pregnancy it was a name that came up in our conversations that we immediately both liked. Kazmir is a variation of a Polish name, Kazimierz, which means keeping the peace, declares peace. Kazimierz the Great was a 14th century Polish king. Kazimierz is the name of a historic area in Krakow founded by this king and was a thriving Jewish community from the 14th century until WWII. The name Casimir was in my family as it was my great uncle's name. We think the sound has an exotic feel and evokes Kashmir, the far away, middle eastern land. Kaz's middle name, Bernard, was Josh's grandfather's name. Through his mom and other relatives we had heard such fond, warm memories of a kind, generous man and wanted to honor him in our son's name. Now, I'd like to introduce you to my little man, Kazmir! The pictures were taken over the last seven weeks. My, look how he's grown! We now lovingly call him "The Tank" due to his 12 lb. solid physique. He is thriving. Smiles are shared with us daily! What a thrill. Thank you Aunt Katie for the Rocket Man Onsie. I think June may be my favorite month in the garden. There is somethings about waking up to the first morning light paired with a particular call of a type of bird in the forest that sweetly sings back and forth to each other as the sun rises. The lengthening days, some cool and some warm, filled with green growth and colorful blooms make me want to go outside and take a look around at least a few times a day. I love where I live. I love all of it's seasons but there is something about June. A kind of calm, comfortable happiness comes over me. Here are some views taken in my garden, a clients garden that I care for and around my neighborhood celebrating this special time. ... my husband found a few patches of a wildflower called Lady Slippers in our woods. He took me out there for a walk to show them to me. I'm happy to see that so many special native plants make their home in our woods. ...the roses smell so good in my garden around the house. I think I may look up a rose cordial recipe. I bought a cordial in Krakow last summer that is heavenly...now if I can figure out how to make it myself. That would be nice. It was a beautiful, sunny day for the Hilltown Spring Festival on a lovely Saturday in May a few weeks ago. After a winter of work in the studio and two weeks of gathering all the pieces together for my merchandise and table it was a nice to just sit by my wares and know that I pulled my offerings together in a good way to share with an audience and potential buyers. I saw friends and also made some new connections as the day flowed by. I was hoping to have photographs to share of the fair grounds, other activities and basically of the shebang but honestly, I only left the barn where my table was located to use the restroom or to buy a snack, well actually, snacks. A friend who had a table nearby seemed to take an interest and get a kick out of the collection of snacks I purchased, collected and ate throughout the day. Ah...the joys of pregnancy and eating for two! I made sure to have kettle corn, Vietnamese beef jerky and sticky rice, and a nice big cup of local ice cream! Oh, and my friend brought over an oatmeal raisin cookie for me which of course I was happy to munch on. I received pieces of positive feedback about my work and style which was very nice to hear. This energy is charging my batteries for the next push, flurry of activity which will be to list all the new items on my Esty store, make connections with more local stores and begin researching more about my options and finding more opportunities to share and sell my work. Well my hopes are to accomplish this all but as I write another reality is sapping the juice out of my batteries. My energy reserves seem to be flowing directly to the little person who has taken up residence in my belly. And I'm happy about this. I only have a month to go until our baby arrives into our arms so the energy is going to a very important and good thing, towards healthy growth, fat and development for the baby. I'm happy to finally share with you some news about the festival that happened last month and also share the reality that I'm slowing down...for now. The greens this time of year are my favorites. From the moss on a wet rock beside a stream, to the fuzzy green texture as I look at many different trees leafing out on a wooded hillside in the distance and as I look up at the sky through the emerging leaf canopy. Spring green is so fresh, so unspoiled, so special. I spent a couple hours in the woods around my house looking this past warm Sunday afternoon. Looking at the green, looking at the water and rocks, and looking for the plants I love to see and visit this time of year. One of my favorite wild native plants is the Trillium. I found a Trillium island. A rock settled in the stream with a stand of Trillium growing on it. I imagined it is a small fairy like oasis on a big mossy rock, a place I would like to see if I ever shrunk, "Alice-in-Wonderland style", to see and experience from a much smaller perspective. On the way back to the house I found a place hosting many Jack-in-the Pulpit plants. I bent down to gently lift the lid of the flower and peek inside. Time in nature never ceases to amaze me. The older I get, the more I enjoy it. It feels like every season and every year is a chance to visit old friends and also the chance to see and sense with a newness and freshness. I'm so looking forward to sharing these special places and plants with my child and watching them become aware of how things spiral back around in a familiar, seasonal comforting ways and yet how each year brings a whole new opportunity for fresh perspective, growth and engagement.